According to the traditionally accepted Western myth of creation, God formed the world out of the void and darkness that covered the face of the deep and then proceeded to create a race of beings to populate this world. In this story, then, God plays an explicit role of authority and power while humans always must bow and give thanks. How would history differ, though, if the versions of this story as told by various secret societies were accepted as the normative story? 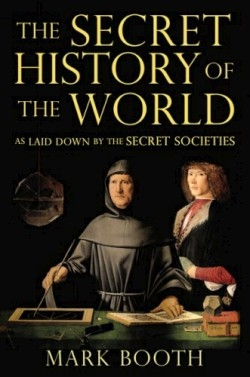 In a brilliant, exhaustive, and groundbreaking study, Booth, who is publishing director at Century and has taught philosophy and theology at Oriel College, Oxford, gathers the insights of so-called secret societies such as the Freemansons, the Rosicrucians, the Knights Templars, the alchemists, and the Cabalists into the mysteries surrounding the creation of the world and humanity, the forces of good and evil, and the end of time. For example, Booth demonstrates that the Mystery schools of Greece and Rome enacted the drama of creation in three acts. “The first act dramatized Saturn’s oppression of Mother Earth…The second act dramatized the birth of the Sun and his protection of Mother Earth. This, the paradisiacal time of the flower people, was remembered as the Age of the Sun.” In the third act, “earth and sun separate…the earth cools and becomes denser. It shrinks and the whole of its watery surface is covered by Adam and Eve and their flowery, gently fluttering progeny.” With an evangelistic fervor, Booth holds up a looking glass to traditional stories of God and the world, demonstrating that the universe is a human creation and that humans are godlike creatures able to embrace the totality of the cosmos and to discern in their hearts the secrets working of the universe. Booth’s luminous prose, his fast-paced storytelling, and his astonishing breadth and depth of knowledge about a multitude of secret societies provide breathtaking glimpses into worlds that heretofore have been little explored.